The Whittington is a teaching hospital and hosts clinical students from the University College London with over 300 students on site at any one time during the academic year. The Undergraduate Centre at the Whittington Campus is located on Level 3 of the Highgate Wing. The Hub, based in the Highgate Wing includes a social learning space, room for quiet individual study, a book collection, computer cluster and seminar rooms. The Whittington is one of the three main teaching sites of UCL Medical School. 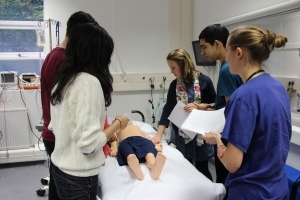 The Whittington Hospital has been a teaching hospital for several decades, and it has always been highly regarded for the educational experience it offers students in their clinical years. For information about the medical student role in the hospital and their patient interaction please see the PDF document below.